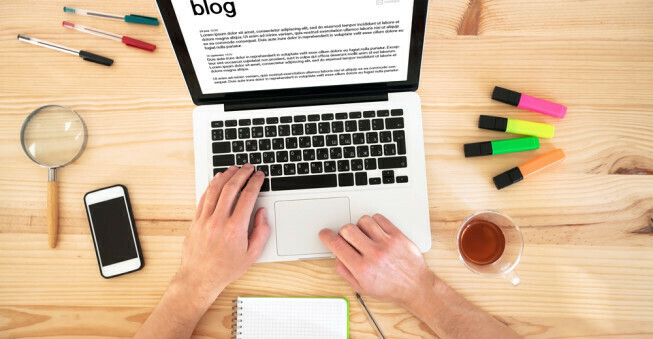 Your blog is probably one of your company's most valuable marketing tools. You use it to build trust with your customers, generate leads, educate consumers, and build brand awareness. So, if a reader tells you your blog's content quality is poor, that comment will probably make you cringe just a little. The best company blogs are engaging, deliver value, and align with the company's business strategy. The content you develop for your blog will help you deliver a consistent brand message. It's often challenging to consistently publish valuable and engaging content. These 10 tips will help you get started. Compelling titles and introductions make your readers want to read your post right away. Wishpond contributor James Scherer says, "recent studies show that while 80% of people will read headline copy, only 20% will read the rest. This is the hidden importance of great titles, and why getting them right is so vital to a successful blog." Good corporate blog posts are targeted to a particular audience. So, before you start developing content, decide who you are selling to and what you are selling. If you are selling to decision makers in the publishing industry, write a blog post that targets their specific needs. If you are a web developer, try to make the content professional but not too technical because you want buyers to know the benefits of using your services. The H2 Real Estate blog does a great job of developing content that helps potential homeowners learn more about the community where the available homes are located since this is usually an important issue for homeowners. Don't pat yourself on the back in your blog posts, bragging about what you know about your industry. Let your blog visitors find the value themselves in the content you produce. The goal of your content is to build trust with your audience. You do that by positioning yourself as an expert in your industry. A great blog post follows basic search engine optimization (SEO) rules: the use of keyword optimized titles, a good keyword ratio, keyword anchor text, and the use of your targeted keywords in the first and last sentence. Mastering SEO best practices will make your content more relevant to targeted search engine users. [Marketer] Neil Patel did A/B testing on his site and found that his homepage with 1,292 words led to more leads - better leads - than a second web page with only 488 words. Why? The content on his page answered questions that were commonly asked from customers. He was already solving their problems before they even bought his product! The word count wasn't the deciding factor as much as what was actually being said. You are writing for a reason - to connect with the readers and trigger an action. You should always end a blog with something that moves the reader to perform a desired action; however, be very careful about using your blog posts to ask readers to buy things. That could backfire. HubSpot's Customer Demand Manager Rachel Sprung says "you can increase conversions by including more CTAs on your blog if they're several different types of CTAs, in different formats, addressing different parts of your marketing funnel." You want to educate your reader. If your posts are useful and informative, you will receive a steady stream of repeat traffic. As you develop content, ask yourself "do I find this useful or informative? Will the reader find this useful or informative?" These two questions should always serve as your guide. The content should provide valuable and useful information to the reader. It should teach them at least one or two things or answer at least one question they have. This can be adjusted depending on where the content will be published (such as a blog, website, or social media) and what the main purpose of the content is. The information can range from general information like you might find in a blog post, to strategic information like you might find on a website or in an ad. Great company blogs consistently develop content for a specific audience. Those blogs deliver valuable and informative content that's optimized for search. The titles are catchy and the readers are compelled to perform a specific call-to-action after reading the content. If this isn't your blog, you have some work to do.